Casio transformed the concept of the watch — from a mere timepiece to an information device for the wrist — and undertook product planning based on this innovative idea. 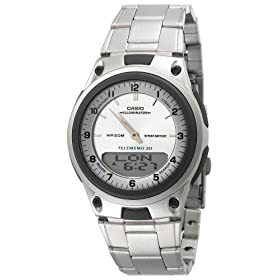 We developed not only time functions such as global time zone watches, but also other radical new functions using Casio’s own digital technology, including calculator and dictionary functions, as well as a phonebook feature based on memory technology, and even a thermometer function using a built-in sensor. The memory-function watches became our DATA BANK product series, while the sensor watches developed into two unique Casio product lines of today: the Pathfinder series displaying altitude, atmospheric pressure, and compass readings. Today, Casio is focusing its efforts on solar-powered radio-controlled watches: the built-in solar battery eliminates the nuisance of replacing batteries, and the radio-controlled function means users never have to reset the time. In particular, the radio-controlled function represents a revolution in time-keeping technology similar to the impact created when mechanical watches gave way to quartz technology. Through the further development of high radio-wave sensitivity, miniaturization, and improved energy efficiency, Casio continues to produce a whole range of radio-controlled models.